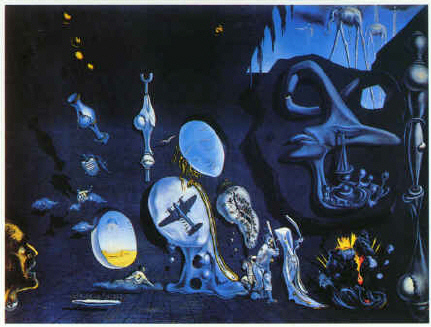 Salvador Dali was Spanish painter, designer of jewellery, etc. and stage-sets, book ill. and writer, notorious for his extravagant and eccentric statements about himself. Salvador Dali joined the Surrealist movement in Paris in 1929 making the Surrealist films Le Chien Andalou (1929) and L'Age d'or (1931) with L. Bunuel and painting such works as The Persistence of Memory (1931) and Premonition of Civil War (1936). His paintings, which he has called 'hand-painted dream photographs', are characterized by minute detail, virtuoso technique, ingenuity and showmanship together with elements of Freudian dream symbolism. His religious paintings include Christ of St John of the Cross (1951). Later works include ills for Alice's Adventures in Wonderland (1969). His publs include Diary of a Genius (trs. 1966) and his Unspeakable Confessions . . . (trs. 1976).